Richard Fries got the call to work the Cyclocross World Championships in Tabor, Czech Republic, but I got the call to work the next most important bike event on the calendar on January 30th - The Harpoon Indoor Time Trial. Richard did the announcing for the inaugural HITT in 2009, but for good reason declined this year. When they told me it would be at the Harpoon Brewery, I was happy he couldn't make it for year number two. As it turns out, the HITT is the largest indoor time trial in the world with about 260 participants competing in heats of 24 at a time. It is kind of like riding the trainer in your basement but with 23 friends all hooked up to computers that measure speed, distance, and wattage. Too bad it didn't measure BAL also, but we'll get to that in a few paragraphs. The technical side was handled by Fast:Splits, a shop and training facility for endurance athletes in Newton. They seem to be quite popular with the triathalon crowd, a scene I know very little about. Fast:Splits brought the 24 computrainers and the computers to monitor and record everyone's output. Capron lighting and sound brought 9 big flat panel screens so everyone could see their progress in the race. And Harpoon provided the venue and the beer - lots and lots of beer. On tap they had their IPA, the seasonal Celtic Ale, UFO Pale, and UFO Heffeweisen for everyone to try. We started the first heat at 12:30 PM with the first 24 riders. I don't think any of them were USA Cycling types, at least I didn't recognize any of them. They turned in some impressive times, finishing the 8 mile course in around 20 to 25 minutes. I was still trying to figure out this whole "indoor time trial" computrainer thing at this point as this was my first exposure to it. In fact, this was my first exposure to the world of watts. I am old enough that all we had in my day were heart rate monitors and we liked it that way. And that was only the last couple of years of my so called "career". Most of the time we just rode hard or rode easy, it was very subjective. So when I arrived at the brewery for the HITT, I had no idea if 400 watts is Pee Wee Herman power or Fabian Cancellara power. Turns out, it's closer to Cancellara and there would be a few who would come close to putting out 400 watts for almost 20 minutes. The route was a simulation of the final 8 miles of the 150 mile Harpoon Brewery to Brewery Ride (aka B2B). It was mostly flat until mile 6 where a 5% grade kicks up for almost a mile then it's a downhill to the Harpoon Brewery in Windsor Vt. Last year's best time was set by Cort Cramer (Svelte Cycles) at 19:11 with an average power output of 362 watts. For the women it was Ironwoman pro and former US swim team member Dede Griesbauer at 20:57 and 282 watts. Did I mention that Harpoon was giving away beer? In addition to two free beers to each competitor, they also gave away a case of beer to the mens and womens winner of each heat. Brian Quigley (Colavita) was the mens winner in the second heat and got to take his place on the Harpoon Hot Stool which was kind of like a wobbly life guard stand with two barstools on top. After saying "hot stool" a couple of times over the mic, I unofficially renamed it the Harpoon Hot Seat. I think that sounds better and led to fewer chuckles from the audience. Quigley's time of 19:52, although half a minute slower than his second place time last year, held up for several more heats. 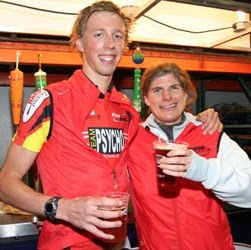 While on the Hot Seat, he was served as many beers as he wanted and got to wear the Mavic Red Vest of Courage, the "maillot jaune" of the day. He told me the secret to his success was a combination of lots of basement training, Rage ATM on the earbuds, and Harpoon IPA. Quigley won the Cat 4 race at day 2 of the Downeast Cyclocross in October so apparently he has some skills to go with the power. It was not until the sixth heat, 3 and a half hours later, that Quigley was dethroned by Jeff Capobianco (Breakthrough Coaching) so he had plenty of time to enjoy a couple of IPAs while on the hot seat. Capobianco's time was 19:37 and that was looking good until the 8th heat when the inter-family grudge match between brothers-in-law Dave McCutcheon (Mass Bay Road Club) and Arnold Roest (Team Psycho) took place. This heat also included the heavyweight sub-division for those over 200 pounds. Among them was Scott Shaunessy, a former NHL player who lead the league in penalty minutes two years in a row. "Just putting on the foil, coach." He didn't look at all like a Hanson brother, but he definitely looked like a big dude on a bicycle. He turned out a respectable time of 20:56. But the winner of the heat would be Roest with a new best time of 19:32, beating his brother in law by 50 seconds to take family bragging rights. Roest is the guy you might have seen at the races with the Surly Pugsley with the motorcycle tires. He won the Cat 4 race at the Ice Weasels race on that thing. Here's a picture of it from the Brockton cross race in 2008. Note the fixed cog on the front tire just in case the back axle breaks. This bike is made for survivalist nut cases. Roest didn't use this bike on the computrainer. Roest's time held up until the elite men's heat. And by the time we got to that heat, the race was running way behind schedule because it takes a while to enter each competitor's name and assign them to a computrainer. The elite mens heat was the 12th heat of the day and was two hours behind schedule. I wouldn't bother to mention it but it played a factor in the race because not only did the elite men start their heat well after their bed times, several of them also got bored waiting and decided to sample the beer selection before their heat. Robbie King, Al Donahue, Dylan McNicholas, Tom Parsons, Cort Cramer, Mark McCormack, and Peter Bradshaw were all in the elite men's heat. Two time U23 national triathalon champion Ethan Brown was in this heat also. With this crew, even though some of them had been partaking of the beer supply, you knew a new best time would be set. It looked for a while like Tom Parsons would be late for the start when he couldn't get his 29'er MTB to fit the computrainer. Only Tom could be late for a start that started two hours late. It probably didn't help that he spent more time lining up his beer feeds with Kevin Sweeney than he did checking his bike. But, he found a bike that would work and made the start in the nick of time. Read his detailed account here. Ethan Brown would set the best time, showing the inebraited road racing and mountain cyclists what power per kilogram is all about. His 18:37 was nearly matched by Robbie King (Indy Fab) at 18:46.4 with Matt Mitchell (545 Velo) only 0.1 seconds slower. Average wattages over the course for the top three men were 348, 395, and 384 in that order. For Brown, that was close to 5 watts/kg. Robbie is well over 6 feet tall and weighs a lot more than Brown so his watts/kg was less than Brown's despite having the higher raw number. It was about 11:30 when the elite men's heat finished but they took over the top 5 spots in the overall standings and nobody puked. Have you ever seen this look on Mark's face? Or Robbies? Me neither. The women's elite heat was earlier in the day at around 3:00 and included a couple of notable triathlete celebreties in Dede Griesbauer and Karen Smyers. Karen would take the hot seat and the Mavic Red Vest of Courage with a time of 21:05 and an average power output of 265 watts. Having the women's elite race early in the day meant that the women's final results were likely to remain unchanged unless a big upset came along. At least the women in the remianing open heats had cases to beer to ride for and in some heats there were only one or two women so their odds were good. Karen Smyers remained on the hot seat until the awards ceremony at the end of the evening. Amy McGuire was the second women overall at 22:10 and 272 watts with Dede close behind at 22:19 and 251 watts. Dede and Karen were able to fill some of the time between their heat and the awards ceremony with the team event. This event required 8 members on each of three teams to work together like a Tour de France TTT. The lead rider feels the resistenace of the wind at whatever speed they are riding. Any rider within 40 feet of the rider in front of them feels less resistance to simulate the draft. Anyone who has ever been dropped, and that is probably everyone reading this blog, wishes you could still feel the draft at 40 feet in real life, but the simulation is close enough. The team's time is taken on the 7th rider to finish so you can only drop one rider so it doesn't matter at all how fast any individual on the team might be able to go. Team Psycho and Blue Hills Cycling Club were on opposite sides of the room with the Boston Triathalon Team in the middle. All three teams are sponsored by Harpoon. Arnold Roest, who at that point was still the leader of the men's race, was not on the Psycho team because, as he said, he didn't make the cut. That didn't make much sense until we saw the team which included Karen Smyers and Dede Grisbauer and triathalon Olympian Jarrod Shoemaker. To no one's syrprise Team Psycho won with a time of 20:15 for the seventh rider, which was only 5 seconds behind the team leader. The final heat of the night was the collegiate heat with about 16 riders from Boston area colleges including MIT, BC, Northeastern, and Wentworth. Ian from MIT won the heat, and the beer that went with it. His time was 19:56 which was good for 15th place overall. Here is a photo of the two individual winners who both took home a set of Mavic wheels among other prizes. Paul- Thanks for doing the writeup! Other than the schedule delays and the (predictable) technical issues, I really enjoyed the event. Having that many bike dorks around led to some good conversation, and just being in a warehouse packed floor-to-ceiling with good beer made me feel all warm and fuzzy. Karen did win the womens event, but they have her time listed incorrectly. The 21:04 was her Team time, not her individual time. Her individual time was 21:43. If you remember the womens heat, she and Dede were switching back and forth through the event, and Dede finished a few seconds back.